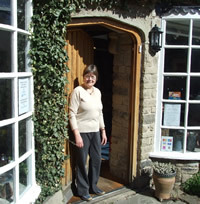 The Gallery is the display and sales area of Baslow Pottery. The original oak beams and stone walls of the 17th century farmhouse make a charming backdrop for the robust character of the handmade ceramics. The majority of the pots are intended to be functional - tableware (mugs, plates, casserole dishes, jugs etc) in high glazes, ovenware, condiment sets, vases, and dishes of all kinds. Ray also produces matt finished frost resistant garden pots. Several other local potters are represented in the Gallery, some of whom specialise in sculptural pieces. There are also fine turned wood pieces made by a local craftsman. The stone walls show a variety of original 2D art, watercolours, oil, acrylic and mixed media. All the artists are well known locally and have exhibited widely. Handmade jewellery in silver, gold, fused glass and clay is also for sale. Made by local craftspeople, these are unique items, individually made.